Back in 2009, we produced one of our most elaborate Radio Free Charleston shows, with a large cast, multiple locations and even costumes and make up–and that was just the host segments. We also loaded the show up with great music. It remains in contention for our best show ever, largely due to our unindicted co-conspirators. Specifically, Mark Wolfe, Amy Williams, Eamon Hardiman, Razor Sharp Productions, The No Pants Players, The Book Exchange and Flare Baroshi all went above and beyond in helping create this little gem. We had a script and everything. 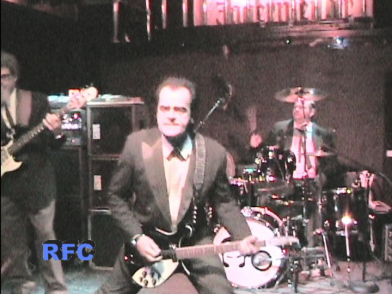 This show features music from Unknown Hinson, The CYAC musical, “The Blob,” The Big Bad and Flare Baroshi. We also have a Mini Movie, and a few extra treats along the way. Our host segments, featured members of The No Pants Players were shot in various locations in Charleston’s East End. Jeff Bukovinsky, Mandy Petry, Joe Wallace and Duncan Stokes met up with us one afternoon, and we proceeded to skip from location to location, shooting our little comedy bits, aided and abetted by Mel Larch, Mark Wolfe and Amy Williams. We did a killer job, shooting guerilla style, and except for the guy playing me, everyone did a great job. Next week we’ll wrap up our selection of the best Halloween episodes of Radio Free Charleston with a spooky seance filmed at Mark Wolfe’s house.